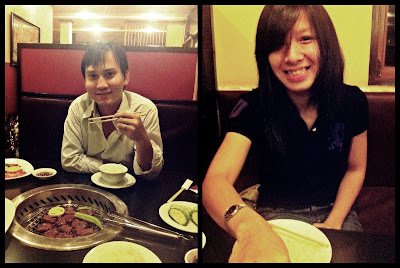 It was late at night when we decided to go for dinner at Shiki. Luckily, the restaurant is open till 10.30PM. We had one hour to eat which is pretty long enough for just an eating. So we had 5 plates of beef, 1 bowl of rice (we're trying not to eat too much grain cos that makes us fat easily) and one plate of cucumber (Salad was out of stock or else we could have eaten more healthy stuff). Afterward, we went for Tequila at Sky Bar, The place. Hahahaha... 2D come to PP and I'll bring you there! Sure! Just make yourself here!